Dead Sea Seacret… Religious Perspective! According to Islamic and Biblical traditions, the Dead Sea is the site of the ancient city of Sodom, home of the Prophet Lut (Lot), peace be upon him. Prophet Lut (A.S.), after consulting with Prophet Ibrahim (Abraham) (A.S.) left Misr and traversed towards the eastern part of Urdun (Jordan), a place called Sodom or Sadoom. The purpose of his migration was to propagate the teachings of Ibrahim (A.S.) amongst the inhabitants of Sodom, a village situated in the area where the Dead Sea is presently located. The earth on which they lived was lifted into the sky and then caused to come crashing down approximately 400 meters below the earth. 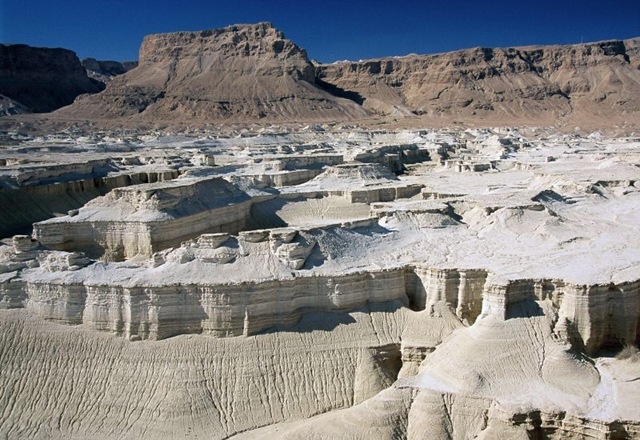 As a result, this area was submerged, and is now known as the Dead Sea. (Qasas ul Qur’an, Vol. 1, Page 257, Mukhtasar Tafseer Ibn Katheer, Vol. 2, Page 312) According to scientists, the area is covered in large deposits of sulphur. For this reason, no life in the form of animals or plants is to be found there and the region stands as a symbol of destruction. It has been reported by Abdullah ibn Umar (R.A.), that when Prophet Muhammad (S.A.W.) descended at the place of Hijr (the region where the nations of ‘Aad and Thamud once resided) during the battle of Tabuk, he (S.A.W.) commanded the Sahabah (companions) not to drink from the accursed place. The Sahabah informed the Prophet (S.A.W.) that they had already utilized the water for making dough and drinking. The Prophet (S.A.W.) instructed them to discard the dough and water. While commenting on this Hadith, Imam Hajar Al-Asqalani (R.H.) outlines that the Hadith clearly teaches us that, it is Makrooh (impermissible) to use the water found in the area of Hijr. He further states, that the same ruling will apply to other accursed places. In light of the above narrations, revelations and explanations, we can conclude that the use of products derived from the Dead Sea is inappropriate and should be avoided. I hope we can all benefit from this Insha Allah. May Allah strengthen our faith and make us among those who guide and whom are guided.